Walking may be the most natural way of getting from A to B, but there must be more to it than that. Are the dandy, the drifter, the dog walker, the peripatetic artist, tourists and their guide, barefoot pilgrims and sign carrying protest marchers all on the same footing? Tomes have been written and TV shows produced about why we walk, who loves to walk, and where to find enjoyable walks. A few famous and keen walkers are Wordsworth, Martin Luther King, Jr., Elizabeth Bennet, Nietzsche, Bob Dylan, and, of course, me. But why do we do it? What is behind this temptation to get out and put one foot in front of the other? Nietzsche wrote, “It is only ideas gained from walking that have any worth.” That certainly bodes well for this blog, as I thought a lot about it while walking. In mid-May, I began a two-week stay in East Sussex. Several years ago, a colleague from Rutgers University and I developed a summer class for students. A simple concept with so many possibilities: We would spend two weeks walking the South Downs and letting the rhythm and landscape, the people and events, provide a springboard for creative writing. An opportunity for these students to develop a sense of place and express it through poetry and prose. As I walk through a meadow smothered in wildflowers near Kipling’s home in Burwash, my heart expands seeing the abundance of daisies, buttercups, cow parsley, poppies, and soft brush tops of a variety of grasses. A herd of cows eye me as I approach, all the while, slowly chewing, chewing, chewing, chewing the spring grass and clover. During this brief staring contest with the cows, my mind drifts to home and the field outside our kitchen window where pointy reed bushes provide a backdrop to the wild foxgloves poking through for summer. Together, both create a camouflage for the hidden-ankle-spraining granite boulders and rabbit holes that make walking through this field a challenge for all but the livestock. An outcropping of gorse, heather and a slow-growing, but determined Rowan tree are reminders of the nutrient weak soil. Sussex! Oh, lovely Sussex! With its soft and forgiving walks, easily navigated with an OS map and a bit of intuition. Even a downpour of rain results in nothing more than getting wet and muddy. It’s rare to have a descending fog, relentless gale force winds and the cold weather that can spell curtains for a rambler gone astray on Dartmoor. I confess, it is wonderful to have a few weeks of walks offering forgiveness under my feet and the freedom of simultaneously walking and looking out at the horizon. While I strut along the South Downs Way, I watch birds soar above and the green undulation of the downs reaching out toward the sea. I let my mind drift. And drift it does. In stark contrast is the country-side of our beloved Dartmoor, significant for its wild, untamed and elusive landscape. Its jagged outcropping of tors, torrential rivers and hidden bogs require a constant vigilance to prevent a misstep or an ankle twist. Remaining ever mindful to avoid stepping onto an unstable rock or into a boggy patch, drowning my boot and socks. As Roger and I cultivate a quieter life, we find ourselves in a more demanding location. In Sussex, I spy lovely cottage gardens – hollyhocks, gladiolas, forget-me-nots – and know none of this could ever survive our acidic soil, battering of rain and wind, cooler and cloudier days where nettle, moss, gorse, and lichen take their time to establish a tenacious existence. The hills and moors of Dartmoor fold over themselves deep into the distance. When one falls from sight, another appears. The only limit upon them is the horizon. Is loving this rugged and untamable landscape like lusting after a strong and silent cowboy? Despite all effort, it may never reciprocate my affections. On a recent walk with Roger and Millie — Sam electing to remain napping on the cool kitchen floor — we set out with a soft sun and puffy clouds above and a strong breeze from behind. About an hour into the walk, a coolness descended and the light turned grey. As we paused to note this, the wind kicked up and we were soon being pelted by hail. The weather swirled around, causing us all to struggle with our steps as if we had been drugged. Racing up the hill, we took brief shelter behind a tor and bemoaned the limitations of a weather app in this microclimate. The wind eventually pulled back and the hail stopped, but not before we were wet, exfoliated and somewhat chilled. Soon, the sun poked out between layers of grey and white clouds as if nothing had happened. We walked home where Roger fixed us a medium-enormous gin and tonic and we moved into the living room and sank into the sofa. Soon we would begin to prepare our dinner, discuss the news or our next project, watch the birds at the feeder, play endless games of fetch with Millie and massage Sam’s old and aging back legs. So why do we stride out? In an ever auto-dependent world, it’s nice to see the country-side, get some exercise, take photos, learn about birds and plant life, catch up with friends, and even stimulate some creative juices unleashing a story or a song. But, it’s more than that. Whether in the company of others or not, there comes a time in every walk where we are alone with only our thoughts and observations, falling neatly to the rhythm of our pace and our breath. And in that solitude, there emerges a sense of self and grounding. Whether it is a familiar path walked daily, or a new trail yet to be discovered. It may just be that no one can provide a sense of place for someone else. We have no choice but to find it for ourselves and it is in doing that — taking it in our own strides, shuffles, struts, or lopes — that we cease to be alone. Lately, the mellow January sunshine is struggling to reveal itself from behind thick wintery clouds. And just like this sun, Roger and I have been busy and lazy in equal measure. In addition to our daily projects, both new and old, we’ve added a twice weekly trip to the local pool for swimming. Aches and pains be damned! The first time we went, I realised I will never be able to better my time or endurance from when I was a kid. At that time of my life, I never wanted to leave the water, sometimes holding my breath as long as I could for the shear joy of it! I would swim fast and hard, challenging myself to go further while racing a friend. Times have changed, and now my goal is to elongate my stroke, measure my breathing, and finish the number of laps I’ve set out for myself within a reasonable amount of time. Oh, and not drown. In addition to fitness, swimming is helping to change up our routine and add some relaxation into our lives. In light of recent events, this is a good thing. We are off the grid for electricity. Our generator, inverter and battery bank run all our essential electoral loads. We store the energy from our generator into two large battery packs, which can keep our lights and the water pump working for 3-4 days if the generator fails. Imagine our surprise while watching a movie, all of the electricity went out. “Surely, that’s not a good thing.” I remarked to Roger. Calmly and in complete agreement Roger said, “No it’s not.” We sat in total darkness for a few moments, coming to grips with the absence of any electricity or the chug-chug-chug sound of our Lister generator. Like swimmers barely making a wave, we were calm and elegant in our response. Either that, or we were in a state of shock as this could spell curtains if we don’t have a functioning generator. A slow sinking to the bottom. Over the nearly five years at Crockern, we’ve become more sanguine about these sorts of challenges, and it’s not just because we’ve returned to the swimming pool. We’ve grown used to unanticipated obstacles and adjusting our plans. Living at Crockern has taught us both to be flexible, determined and patient. We know we aren’t finished with our improvements and renovations. And when we are, we will still be engaged with daily maintenance. That’s just the deal of living in an old house. This week, the weather turned decidedly colder on Dartmoor, but unlike our first winter, we aren’t cold and wet inside the house. Our interventions of insulation, new roof and windows, and a new boiler have made a difference. We’ve simplified electric and water systems and made our lives less stressful as a result. With this healthy dose of perspective, the generator not turning over at 10 p.m. at night, in effect shutting everything down in the house, is just another problem to solve. It’s cold outside and, except for the glow of the moon, completely dark. Roger takes his head torch and heads out to investigate the generator. I dash outside and bring in a few filled watering cans in case we need them for the toilets. Next, I fumble around by the glow of the wood burner, locate candles and set about lighting a few. Instantly, I’m struck that candle light is lovely, but not bright enough to read a book. How did they do it in medieval times? Cross stitching those tapestries must have been murder on the eyes. I’m still deep in my thoughts comparing the frugal method of medieval rush lighting, tallow candles or the more exotic bees wax candles used by nobility, when Roger enters the house with a blast of cold air following. He stretches his shoulder and washes the oil off his hands. While I’m cozied up under a blanket and making a mental note to purchase more candles, Roger is down to a t-shirt and not feeling the cold as he has spent the past thirty minutes and a good deal of effort to manually crank over the generator. I can’t do this, as it requires a good amount of strength. Perhaps after I double my number of laps at the pool, but at this stage, it is not a possibility. Particularly in the dark. With electricity back in order for the time being, I abandon my plans to make and stockpile my own rushes. But, just in case, I leave the watering cans where they are for the time being. The generator is happily chugging along to power up the batteries and we resume watching the movie. Before we call it a night, I let the dogs out for their last constitutional. We drift off to sleep, Sam and Millie chasing rabbits or eating butterflies, while Roger and I have equally busy brains calculating the cost and headaches as we consider replacing our generator. And Hip Hip Hurrah for Roger! He’s a hero! Within no time the next day he has managed to determine the principle problem with the generator. Our reliable old lister is still motoring along and instead the two small batteries, which are relatively new, have gone flat, probably because of the cold. Then again, it may be the alternator, so we are still investigating. Either way, we need to improve the space where the generator is housed. The roof is falling down. The walls need to be shored up. And with that, we can always add some insulation which will benefit those fussy batteries. The project list for this spring is growing longer, but is very clear. We will continue our swimming, charging our own personal batteries, as we move forward on this rather large, and not so exciting, project. The light on the horizon has changed significantly this past week, casting long, broad shadows across the hills. The sky is filled with an eclectic mixture of brooding, grey clouds adorned with cotton-candy-like puffs of white accentuated with splashes of blue. Crisp leaves are beginning to carpet the ground and collect in corners of the garden and in all our drains. An annual autumn project of clearing leaves has now appeared on our to-do list. The most notable announcement of the season’s change is the formation of the bright flame-red berries dangling from the Rowan trees. Where did the summer go? It seems just yesterday we were filling the long days with visitors and projects. 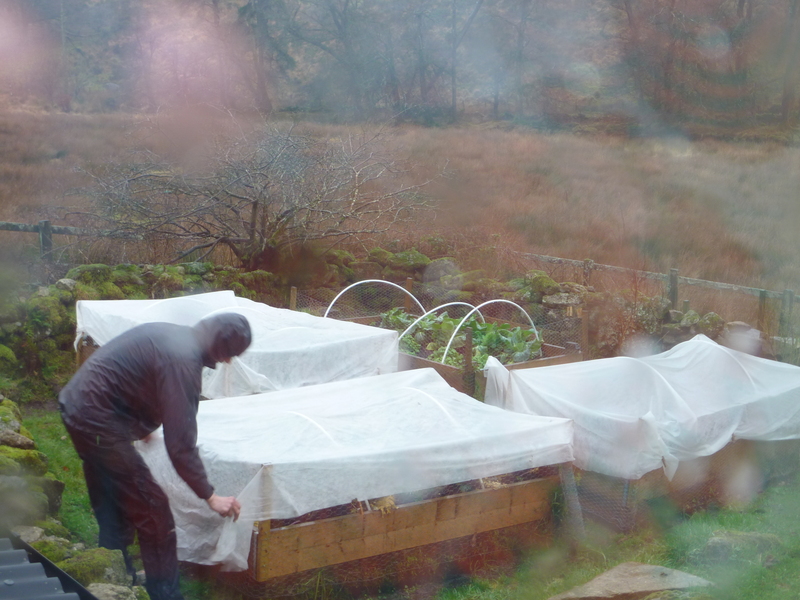 We were busy tending to the vegetable garden and our on-going repair of stone walls. Daily we pulled weeds, maintained the garden, and filled potholes. We spent hours gathering and consuming the abundance of our vegetable beds, building a new fence — which resulted in an unfortunate concussion for Roger — juggling family demands and embracing the arrival of the thoroughly modern Millie! In the summer months, we carry on with all our activities until our bones and muscles ache, taking breaks to walk Sam and Millie or have a cup of coffee. By the end of the day, covered with dirt, we put away our tools, clean ourselves up, and prepare dinner. Afterwards, we take a glass of wine and make our way back outside to soak in the hot tub. We make plans for the next day while the night shift of wildlife clocks-in. On a clear night, one by one, the stars appear in the sky and the bats flash past to feeding on new insect life. Foxes and badgers make their plans for the evening’s hunt and forage, and the tawny owl in the stand of pines across the valley sings a musical riff. Now, as I walk the dogs in the early morning, I feel a chill in the air and can see our breath in the dawn air. This first walk of the day is one of two stories: Sam sniffing all the news of the day to come and slowly awaking his achy bones as he lumbers down the track; while Millie darts from one moment to the next, chasing her toy and racing past me and Sam to exercise her job as the Ambassador of Joy! I certainly have my pre-coffee challenge with the two dogs moving at different speeds and entertaining their different interests, but our pack of three sync up with the pleasure of the crisp morning air. As we turn the corner on our walk, down in the valley the fog hangs along the river as if a dragon flew past in the night and left a breath trail. 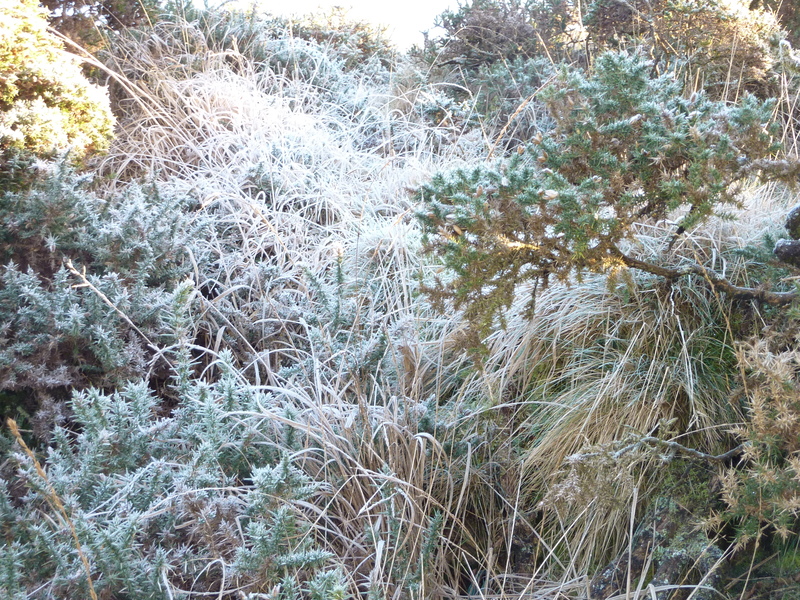 Exposed by the morning dew are the webs of the thousands of spiders who make their homes in the gorse bushes. With the arrival of cooler temperatures, many of these spiders now seem to be making their homes inside our house and not a day goes by when I don’t discover yet another large arachnid awaiting rescue from the kitchen sink. It’s not just spiders who have made their way into the house, we’ve had a few bats too. Recently, I was spending the afternoon stacking our winter wood supply in the barn when I noticed something flapping about in jerky flight. Too late to be a swallow or a house martin, they’ve left for warmer climates and won’t be back again until the spring. When I stopped to investigate, I spied a bat hanging upside down in the rafters. I’ve not seen it there before or since, so I suspect this is simply a temporary rest stop as it was too early to be out and about hunting insects. Sure enough, later that day Roger and I spent the better part of the evening trying to isolate the Horseshoe bat, which had found its way from the barn into the house. The greater horseshoe bat is one of the larger British bats with a wingspan of about 35-39 cm, and also one of the rarest. We are in one of the few areas in the country where these bats are still breeding, so it is a treat to see one. After Roger photographed and confirmed its identification, we managed to get it into a room where we could close the doors, turn out the lights, and open the windows so it would head out into the night to commence its hunting before returning to its roost in parts unknown to us. As the plants die back to conserve their energy for a spring bloom, so too, Roger and I have turned our attentions to readying for winter. But we aren’t there yet. Soon, we will spend more of our time inside by the fire and less outside. As the nights draw in and our wood burner provides daily comfort, we will turn our attentions to projects inside. We have a water tank which needs replacing, pipes which need relocating, and we’re making some changes to the hot water system as a result. Roll on Autumn…. Recently I attended a navigation workshop for women offered by Two Blondes, a fabulous business run by two women dedicated to getting everyone outside exploring (check them out: http://www.twoblondeswalking.com). 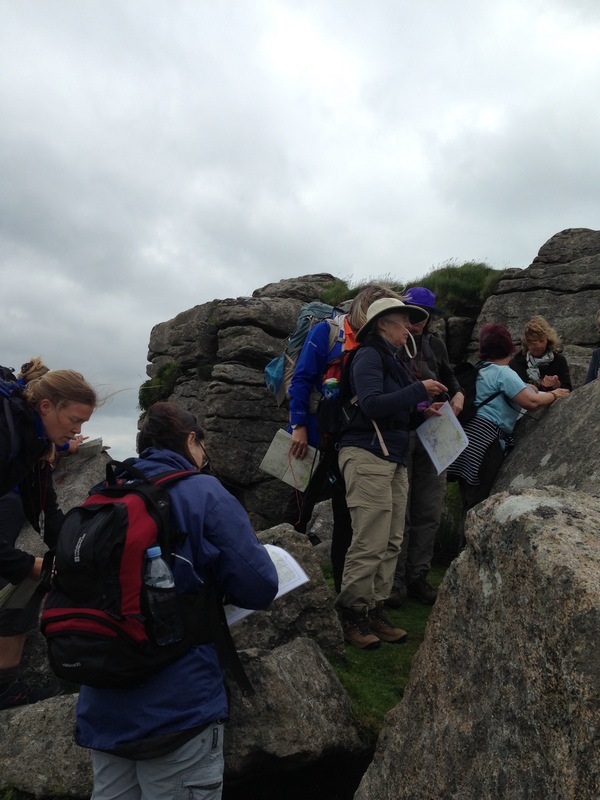 The idea of other like-minded women, interested in the outdoors and Dartmoor appealed to me. But learning to properly use a compass, well that was the cherry on top! How had I gotten to my fifties and not learned this skill? Three of my four brothers were Eagle Scouts and my Dad was a Scout Master with the Boy Scouts. As a family, we frequently went camping. And yet, no one taught me this basic skill. Is it possible I’ve never learned because I never needed to do so? Years ago, friends and colleagues gave Roger a silver cup engraved with “The Navigator”. When it comes to using a compass in the wild, I’ve obviously relied on Roger. It’s easy to let him figure out our route, while I mind the dogs, look at the landscape and enjoy myself. And given that engraved mug, who wouldn’t cede responsibility? But it is not sustainable to take the back seat and rely on others to explore new areas. The times I’ve gone out to explore on my own, map in hand, I’ve managed to get somewhat lost on Dartmoor. Not so much lost, really, but haunted by an overriding awareness that I could get lost at any moment. Then what? 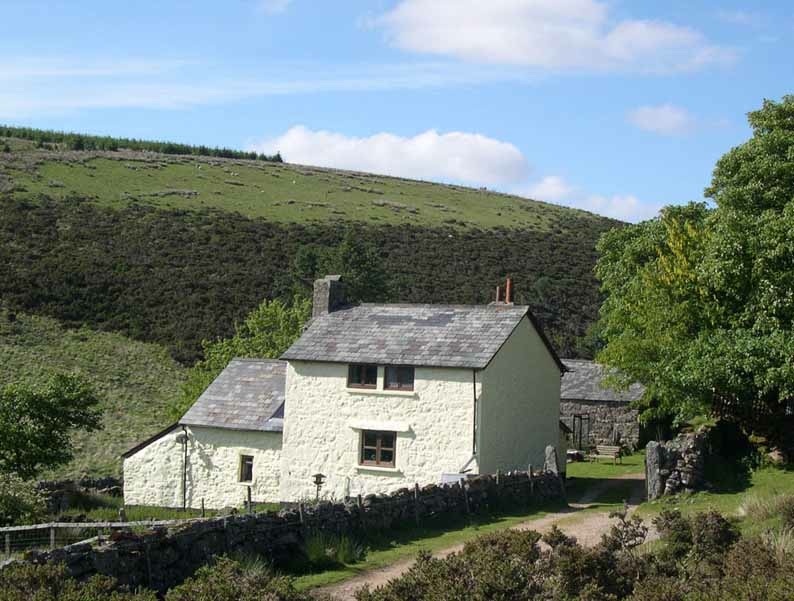 Dartmoor is a tricky challenge, which is why the military train and orienteering activities like the Ten Tors or Duke of Edinburgh are held here. The usual landmarks found in other national parks are often absent. Forests change due to cutting. Walls on the map aren’t always there as they may be historic and grassed over. Pillow mounds and hut circles, easily identified by archaeologists or skilful navigators, often look like a pile of rocks to me. Add to that, the weather can be like the ocean with shifting tides from clear, calm waters to rip tides putting an innocent swimmer in peril. Knowing what you’re doing on Dartmoor is a good idea to say the least. Thirteen of us gathered for our workshop by Two Blondes. Armed with our OS maps, compasses, and enthusiasm, we chatted about why we were there: “I want to get my skills and sense of direction back.” “My partner always reads the map….what if he drops dead?” “I just want to do something for myself and sometimes that means walking by myself.” I was in good company. All these women, ranging in ages and skills, backgrounds and interests, were crooning just like Annie Lenox and Aretha Franklin, we were doin’ it for ourselves. Soon, the workshop begins and we open our maps to locate towns, pubs, buildings, footpaths, woods, and rivers and streams. We calculate distances, times and read the contours of elevations. All of this was familiar from the hours I’ve spent pouring over OS maps. I love them for their detail and history. These beautifully scaled representations of the land are the key to exploring, complete with the easy to use 4 or 6 figure grid reference system. This part of the workshop was interesting, but when we were going to get to the compass? That little magnetic mystery that somehow holds the key? Every skilled navigator will say, “trust your compass.” But mine, with its needle, orienting lines, directional arrow, declination line, magnifying round and compass scale sat there teasing me. Then suddenly, one of the Two Blondes announced, “Okay, everyone pull out your compass.” At last! And within minutes, what had always seemed difficult and elusive, was made easy. Roger has explained how to use a compass before, but often he assumes I know what he’s talking about. Because it is familiar to him, he enthusiastically shows me all the cool things, without ever setting up the basics. He tells me about true north, magnetic north, and how the map shifts out of north by 1 degree, 29 minutes every year. My mind drifts. Is this how Robert Scott and his men missed their South Pole destination only to die tragically close? It is fair to say, Roger is operating from the notion that I surely must have some basic concepts about this simple, yet revolutionary, circular instrument. But the Two Blondes knew that we few, we happy few, we band of sisters didn’t know and thus provided a simple, encouraging, and educational approach to using our compasses. And it is so easy and fun! I now see why Roger would make the assumption I had a basic understanding. After mastering our compasses inside, we set out on a walk. Navigating is not just about the compass, it is also about timing and distance, so we learned our pacing. We set a bearing and headed off to find a pool on the moor. Why would anyone ever want to go off a path and find a pool/bog marked on the map? Well, because it’s on the map and with a compass and a little know how you can. And what a find! This bog area was covered in all manner of wildflowers and dwarf shrubs of heather and billbery, along with sedges, cotton-grass, deer grass and purple moor grass, the likes of which I hadn’t noticed along the path. And because of the boggy nature of the area, all the grazing animals stayed clear, so there was indeed a different wildness to the flora and fauna. The path we left was still busy with other walkers, families, bike riders and the like. But up by this pool, away from the path, we could only see the Dartmoor wilderness — that vast landscape rich with varied ecosystems. We noticed small blue flowers, heard bird song, and spotted sundew, a small carnivorous plant with red spiked leaves to enable it to catch insects to supplement its diet due to the poor nutrient levels of the blanket bogs. What we couldn’t see was the footpath, or anyone on it, and we were a mere 250 meters away. Oh, I’m hooked alright. I love the compass and the idea of being able to learn to orienteer with greater skill. I love how ordinary it looks, but that it powerfully denotes direction. I also prefer my little compass to the modern geospatial app on my phone, which is useful but not foolproof. When I got home, I told Roger all about my day. He shared my excitement and showed me another type of compass, a sighting compass. I had no idea we had this little treasure. He attempted to explain to me how it worked, and nearly failed until I explained how the Two Blondes taught us to use a compass at which point, he wound back his enthusiastic description so that I could see its potential. Practice and patience will improve my skills as it isn’t exactly rocket science. In the coming days, I plan to set out and make a few discoveries on my own so that all of us can safely get lost together.